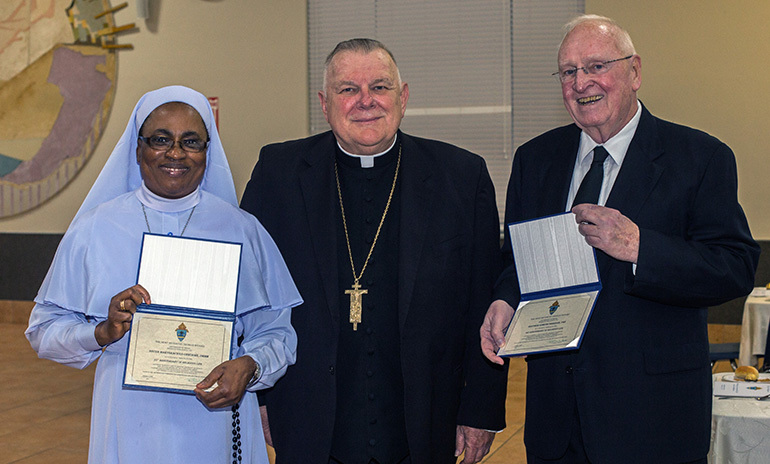 Sister Marygracious Onwukwe, of the Daughters of Mary, Mother of Mery, and Marist Brother Edmund Sheehan, pose with Archbishop Thomas Wenski and the certificates they received marking their 25th and 60th jubilees, respectively. MIAMI | Consecrated religious, wearing the habits and robes of their various orders, filled the pews of St. Mary Cathedral Feb. 2 as Archbishop Thomas Wenski celebrated a Mass in honor of the World Day of Consecrated Life. 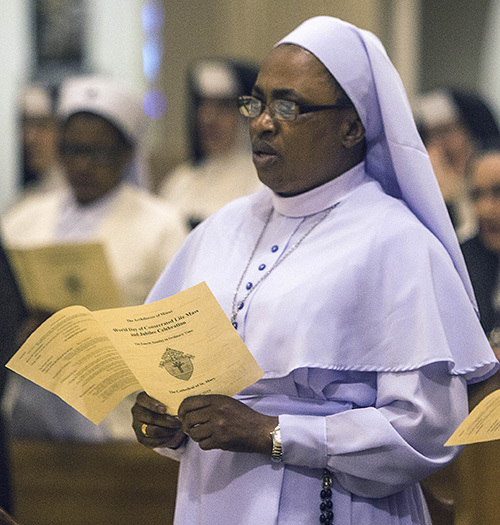 Sister Marygracious Onwukwe, marking 25 years with the Daughters of Mary, Mother of Mercy, takes part in the Mass for the World Day of Consecrated Life. 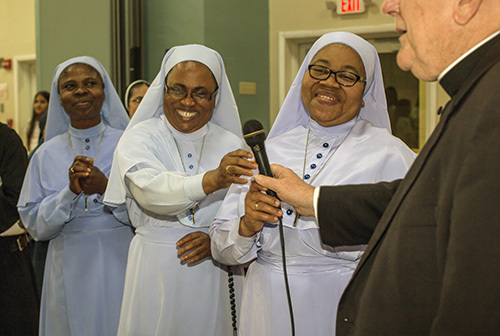 Sister Marygracious Onwukwe hands the microphone to Archbishop Thomas Wenski after she and Sisters Therese Martin and Sister Mary Agatha, of the Daughters of Mary, Mother of Mercy, sang a Nigerian food blessing at the reception that followed the Mass for the World Day of Consecrated Life. 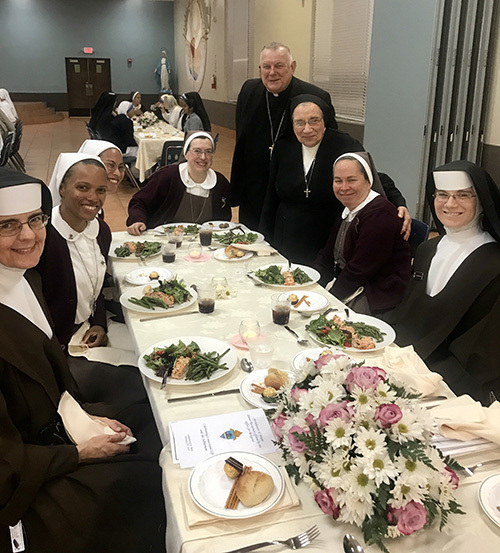 Archbishop Thomas Wenski poses with members of two religious communities, the Servants of the Pierced Hearts of Jesus and Mary and the Carmelites of the Most Sacred Heart of Los Angeles, at the dinner that followed the annual Mass for the World Day of Consecrated Life, Feb. 2 at St. Mary Cathedral. On behalf of South Florida’s Catholics, the archbishop paid special tribute to two religious jubilarians, from different corners of the world, one celebrating 60 years of consecrated life and the other celebrating 25 years. Born in Esopus, N.Y., Brother Sheehan attended St. Helena School in the Bronx. He said the example of the Marist brothers inspired him to join the order. He received his habit in 1959. He then earned degrees from Marist College, the University of Miami, New York University and the University of Texas, Austin. He has worked as an English teacher, school administrator and librarian at Christopher Columbus High School in Miami for 35 years. Sister Mary Gracious Onwukwe, known as Sister Maryg, 49, was born in Nigeria and had her religious formation in her home country. She professed her vows in 1994 in the diocese of Okigwe, Nigeria. Like Brother Sheehan, Sister Maryg said the example of her school teachers in Mbano, Nigeria, inspired her to join a religious community. Like her teachers, she became a Daughter of Mary, Mother of Mercy. “Their lives really touched me,” said Sister Maryg, who was celebrating her silver anniversary. She works as a nurse at Baptist Hospital in Homestead. She started as a nurse in her hometown, then came to Miami where she served at St. Ann’s Nursing Home until 2009. Sister Maryg went to Maryland in 2009 and worked at a nursing home there until returning to Miami in 2017. At the beginning of a reception after Mass, Sister Maryg, along with fellow Nigerian sisters from her order, Sister Therese Martin and Sister Mary Agatha, surprised other religious when they sang a meal blessing in their native Igbo language, then handed the microphone over to Archbishop Wenski, who recited the blessing in English. The archbishop thanked the men and women religious who seek to follow Christ by living lives of self-giving love in imitation of Christ who came not to be served but to serve. At the conclusion of the Mass, the archbishop presented the two jubilarians with certificates in honor of their years of dedicated service. 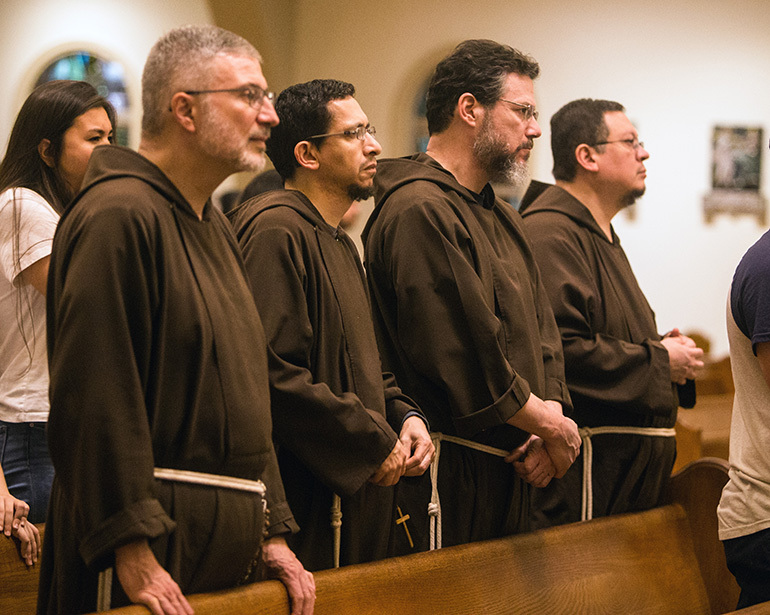 Capuchin Friars, two of whom have been assigned to the newly erected St. Pio Friary at St. Jerome Parish in Fort Lauderdale, take part in the Mass for the World Day of Consecrated Life, Feb. 2 at St. Mary Cathedral.